Prime Minister Sheikh Hasina yesterday said the Awami League will uphold the dignity of the confidence and trust that the people reposed in the party through the December 30 elections. 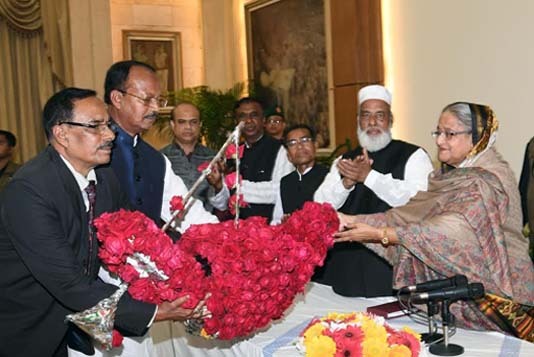 The prime minister also asked all concerned including the Awami League leaders and workers to move with utmost patience and tolerance by showing the respect of the people’s confidence and trust, according to BSS report. Sheikh Hasina was addressing the leaders and workers of Kotalipara and Tungipara Upazilas Awami League and their associate bodies who called on her at Ganabhaban in the evening. The premier said the people gave their huge mandate in favour of Boat in the last elections for the third consecutive term as the government of Awami League ensured massive and balanced development of the country. Putting emphasis on upholding dignity of the massive mandate of the people, Sheikh Hasina said huge development work is now going on in the country. “The work of the schemes will have to be completed on time, while more new projects will be taken to advance the country further,” she added. In this context, Sheikh Hasina said following the principles of the Father of the Nation she has been working to materialise his dreams and ideals. “The main inspiration of my politics is Bangabandhu and Begum Fazilatunnesa Mujib,” she said. The prime minister came down heavily on the BNP leaders for their some negative remarks on the 11th Parliamentary Election. She said the higher court of the country declared illegal the grabbing of state power after 1975 by Ziaur Rahman violating constitution and Army rules. “Through the verdict, BNP has become an illegal party,” she said. “That’s why various international organisations including the United Nations and the Commonwealth did not recognise military dictator Ziaur Rahman,” she said. The AL president said it was Ziaur Rahman who introduced the politics of vote rigging and handed over arms to the meritorious students. About conviction of Khaleda Zia and Tarique Rahman, the prime minister said the BNP chairperson has been in jail following the court verdict for her corruption, while Tarique is a fugitive and convicted person on graft, money laundering and 21st August grenade attack cases. About the debacle of the BNP in last general elections, Sheikh Hasina said sensing their defeat, the convicted and fugitive BNP leader did nomination trade and put their seats on auction. She said the BNP had realized through surveys of different international organisations that they will not win the polls. “That’s why they tried to make the election questionable by staging drama in the name of elections,” she said. The prime minister said her government has executed the verdict against war criminals and the killers of the Father of the Nation as well as those who were involved in the jail killing. Besides, trials against the corrupts, money launderers and 21st Grenade attackers have also been finished, she said, adding that the country has now become free from the stigma. The prime minister reaffirmed her government’s determination to take the country towards development and prosperity further so that nobody suffers from any misery. Sheikh Hasina requested the leaders and workers to convey her greetings and gratitude to the people of Tungipara and Kotalipara for reelecting her time and again.